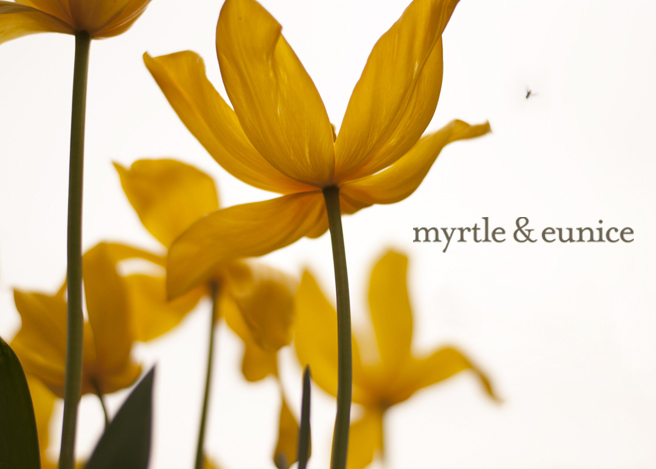 Right on the eleventh hour, I have come over all autumnal blog overhaul. 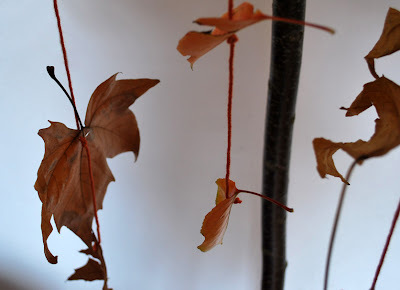 * And with fifteen sleeps ’til winter, (we don’t do solstice dates downunder), we have had a chilly and breezy leaves-flying-everywhere weekend. Given our house needs a good renovate and is almost as breezy inside, the kids and I decided to bring in the autumn. Last summer, I pulled out the fried-to-a-crisp, Weeping (sobbing) Cherry from the scorched earth in the garden. I couldn’t bring myself to let it go quite yet. A dead and bewildered looking tree is another sort of inspire wire and perfect for hanging treasures and small person arty bits. 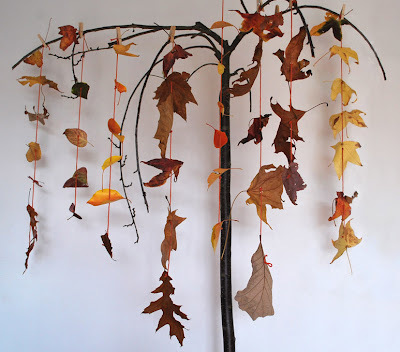 My older kids attend a Steiner school and there is great emphasis on the changing of the seasons, the cycles of nature and the presence of the seasonal table (display with found bits of nature and crafted goodies). Figuring a seasonal tree is a reasonable vertical interpretation, the two big kids set out for leaves in all shapes and colours. Stringing them together kept them busy, while the Whingy One had my attention. An observation: carrying an almost two year old with a whopping great plaster arm cast all day, is bad for the back. Bad for the head, are the concussion-type injuries incurred with all her ‘pointing’ at the Falling Leaves Installation. (Art, that is). In further autumnal developments, I finally tackled the slightly terrifying envelope containing the latest Amitié Blog VIP Club mail out. I hereby confess, I hadn't a clue what to do with strips of beautiful ribbon and even Googled ‘embellishment’, (you’re really not here for the crafty know how, are you?). The God of Embellishment might be miffed, because I cut the beautiful ribbon into bits. The whole number was a thrown together, caution to the wind, great fun to do, affair. 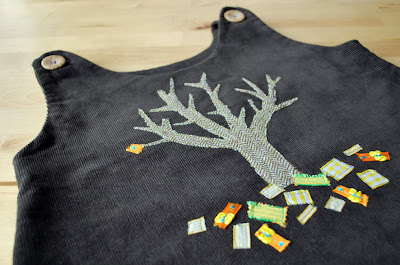 All said and done, there are many bits I don't like and telling myself the fraying tree/leaves would suit a blustery autumn dress was a blatant lie. 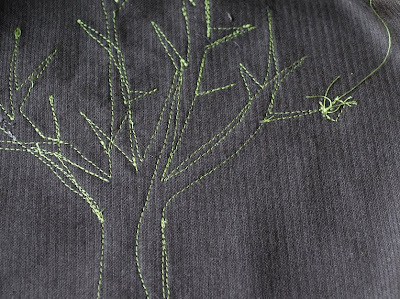 What I do like, is the WRONG side of the fabric with the stitchy tree approach. 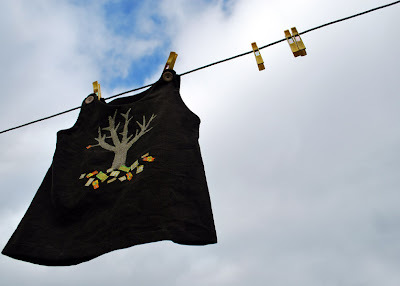 It all needs a bit of an experiment, but without getting too precious and then using felt for leaves, I reckon I could have an autumn dress idea there. Except it’s nearly winter. PS. An ‘OH MY GOODNESS!’ alert: If you haven't already swung by to see some great imagination, photography, craft action and the sweetest red gumboots at work, go visit Jodie at Ric Rac NOW! Oooo...I like the dress! And, the autumnal installation is quite fabulous. I'm looking forward to when my little one enjoys doing stuff like that. Right now, he would probably insist on putting the leaves in the trash or outside. I don't know where he gets the neatfreak streak. I love the embellisment on the dress! Both sides look fabulous...maybe you could make it reversible. Most inspired Tania!Cordoroy pinafores make the perfect autumnal attire. Stunning little dress with such sweet details. WOW! I've seen a few of these Amitie projects around, and this one is my absolute, 100%, #1 favourite. It's gorgeous! I can't believe you're not totally in love with it. I am! P.S. Lovely Autumn pics. I heart Autumn, hard! I absolutely love the ribbon leaves on the ground. Just gorgeous! I love the autumn trees, though it does feel almost like winter at the moment. Wish I could sew... and fit into children's clothes. Agree with Curly pops make it a reversible dress..the 'wrong side' could be Winter and I like the ribbon leaves for Autumn but agree felt leaves are beautiful! I laughed that you googled embellishment! Needing to understand completely before proceeding... I sense a kindred spirit! Now that it has been a few days, look at the dress again. You will see it is beautiful.